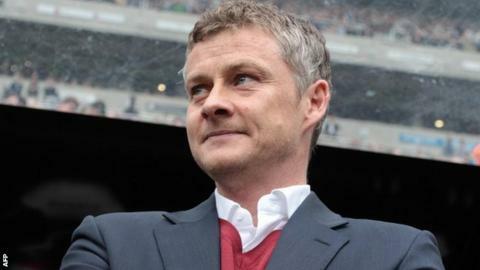 Manager Ole Gunnar Solskjaer says he takes the blame for Cardiff City's relegation from the Premier League. The Bluebirds host Chelsea on Sunday in their final game in the top-flight. Solskjaer replaced sacked Malky Mackay in January, but relegation was confirmed at Newcastle last weekend. "I'll take the blame - I'm the manager - it's my decision, it's my responsibility and I didn't make the impact on the results that I hoped for," said the Norwegian. Cardiff were 16th in the table, one point above the relegation places and four clear of bottom-placed Sunderland when Mackay departed. But they go into Sunday's final round of games bottom of the table and with speculation that leading players could leave during the summer. At a news conference ahead of the Chelsea game, Solskjaer was asked if having a squad largely made up of players with Championship backgrounds had been the reason for going down. He replied: "There's many things that are the cause of us being relegated and I wouldn't blame that on the players being Championship players, no. "I've inherited a squad that's been fighting for promotion for a few years and did well. I came in hoping to make a difference, that we could move up the table. "It didn't happen. [There are] different reasons for that, of course." Solskjaer wants those players to give the club's fans a game to enjoy when Jose Mourinho brings Chelsea to Cardiff City Stadium, but the long-term focus will be on returning to the Premier League. Solskjaer added: "The longer it goes before you manage to bounce back, the more difficult it proves to be. "The financial aspects of the difference between the Championship and Premier League is massive. "So wages and being able to get players in may not be as attractive any more - you've got to do your homework and we have done. "But we'll just have to look forward to next year now - Sunday first, to be fair because you've got to give the fans a good last game, something to enjoy. "We are playing against one of the top teams in Europe, never mind England."